Home / News / Emmerson Mnangagwa: the next president of Zimbabwe? An ambassador to SA from the official opposition political party in Zimbabwe says all indications are that Zimbabwe is heading to military rule. While the Zimbabwean Defence Forces was at pains to reassure the world that the country was not in the midst of a coup, political experts and the opposition Movement for Democratic Change disagree. There was frenzied speculation of a coup but Maj-Gen Sibusiso Moyo said in a televised address in Harare that the Zimbabwe Defence Forces would guarantee the safety of Mugabe and his family, and was only “targeting criminals around him who are committing crimes that are causing social and economic suffering in the country in order to bring them to justice”. But in the past week the country’s war veterans and its white farmers have come together as unlikely allies in a new battle: to unseat President Robert Mugabe (93) and curb the ambitions of his wife, Grace. Together with the opposition Movement for Democratic Change (MDC) — led by the recently sacked vice-president Emmerson Mnangagwa — and with what is thought to be the backing of the armed forces, the farmers and war vets have vowed to form a transitional government whose aim will be to return Zimbabwe to its past glory. An intervention is sorely needed. Zimbabwe stands once again on the brink of hyperinflation and economic collapse, amid the disastrous introduction of a new currency, foreign exchange shortages, a spike in food prices, a spiralling deficit and an unpayable public sector wage bill. Aid agencies have warned that last year’s severe drought, crumbling infrastructure and low agricultural production have sparked a surge of hunger cases this year. In a response to public fury, Mugabe’s government has responded the only way it knows how: by rounding up journalists, banning public protests, threatening "clean-up" sweeps of opposition areas and clamping down on social media users who dare to condemn the president. Senior figures have not been spared this purge of challengers to Mugabe’s 37-year grasp on power. 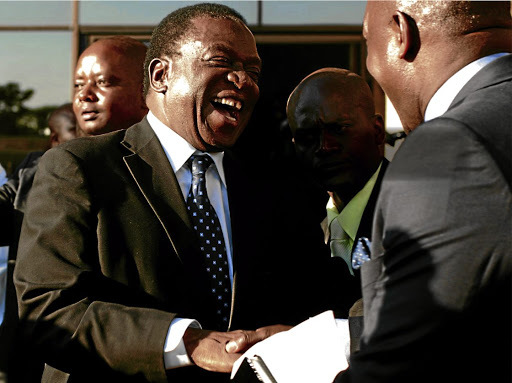 Mnangagwa’s ousting last week came as a shock to even Zanu-PF’s most loyal stalwarts, with Mugabe accusing him of "disloyalty" and plotting against him. It was an eruption in long-simmering tensions between Mnangagwa and his camp in Zanu-PF (known as the Lacoste faction because of the former vice-president’s nickname, "the Crocodile") and Grace Mugabe’s young Turk faction, "Generation 40". Last week, war veterans leader Chris Mutsvangwa — long seen as Mnangagwa’s unofficial spokesman — appeared in Johannesburg, where he unveiled to the media a succession plan that had previously only been reported as rumour. The plan involves the unlikely rehabilitation of Mnangagwa (73), transforming him from Mugabe’s brutal henchman, who led a suppression of rivals in the late 1980s that led to thousands of deaths, into a statesman with international backing. Mnangagwa’s strategy is to work with long-standing opposition leader and MDC chief Morgan Tsvangirai in a transitional government, and invite white farmers back to the country to revitalise the "linchpin" agricultural economy, reach out to old foes such as the UK and US for sanctions to be lifted, and steady the ship for investors to return. The plan, which was met with incredulity when it was first leaked to Reuters in September, was unveiled by Mutsvangwa, a former liberation fighter and ambassador to China, in a room packed with journalists. Also in the audience — and confirming the plan’s veracity and roots stretching back at least three years — were former white farmers, members of the MDC and senior figures from Zimbabwe’s intelligence community. If it were a script for a movie, it would be laughed out of the producer’s office — especially as the war veterans helped Mugabe rig successive elections by bullying and beating rural voters into line. But Mutsvangwa told journalists that all sides have agreed to let "bygones be bygones" and work together to oust the Mugabes from power — either at the Zanu-PF December congress or in elections early next year. "We are for free and fair elections. What has happened in the past — we have seen the light and we have reached out to everybody. Don’t despise us for seeing it later," Mutsvangwa said. "The consciousness of the people is not instantaneous, but now at least we are on the same page." He said that Mnangagwa could be absolved of his past record by leading the country into a brighter future. "The MDC, religious groups, the former Commercial Farmers’ Union — they are saying this man is the one who holds the light to a new and prosperous Zimbabwe." It seems implausible. But for Mugabe it’s a blow mainly because, as one former white farmer at the event said, without the war veterans, he has lost a key pillar of support. "It would be very hard for him to rig elections now," he said. "I really believe this transition holds the key to Zimbabwe’s future." On Monday, there was evidence that another key pillar of state repression was crumbling, as armed forces chief Constantine Chiwenga (who was rumoured to have met with Mnangagwa in China after his sacking) told Mugabe to stop his purge. Citing the examples of Somalia, the Democratic Republic of Congo and the Central African Republic, Chiwenga said Zimbabwe’s military would not allow political "squabbles" to descend into serious conflict. "We must remind those behind the current treacherous shenanigans that when it comes to matters of protecting our revolution, the military will not hesitate to step in."